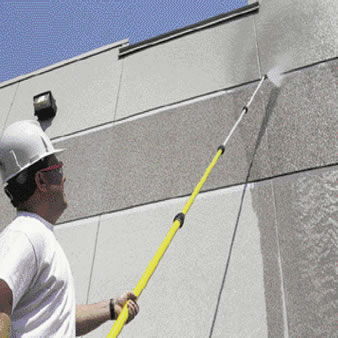 Reach high places with a pressure washer with this telescoping wand that extents fron 6' to 18' long. Made of light-weight fiberglass and aluminum its the easiest handling extension wand for cleaning multi story buildings from the ground. For use uo to 300o F and 4000 psi. * Please call us for any questions on our telescoping pressure washer wand 6 foot 18 foot rentals in Portland OR, Gresham OR, Milwaukee OR, and surrounding metro area.